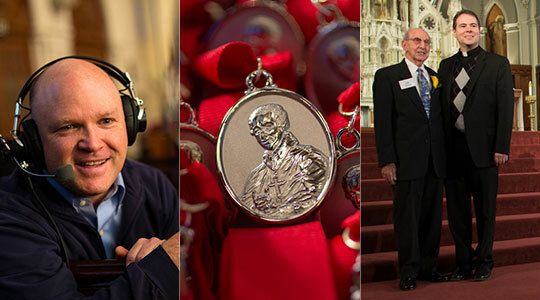 Summary of today’s show: Each year, Cardinal Seán O’Malley recognizes the contributions of dozens of laypeople, religious, and deacons in the Archdiocese of Boston with the awarding of the Cheverus medals. These individuals and couples are recommended by their pastors (or in the case of religious and deacons, their regional bishop) for their decades of selfless service to the Church, work that has often gone unrecognized to most others before now and performed in hidden ways. 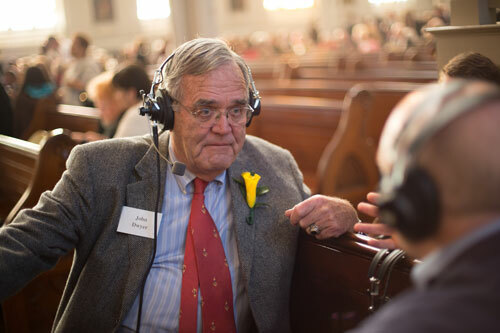 Recording live on location at the Cathedral of the Holy Cross on Sunday, November 18, 2012, Scot Landry interviews a handful of the 122 recipients of the 2012 Cheverus Awards, giving us a glimpse at the vast diversity of those honored, all united in their love of their Church. 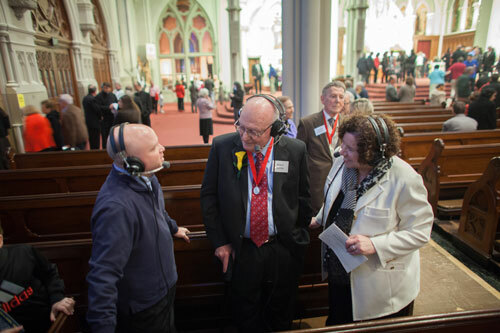 1st segment: Scot Landry welcomed all to the 2012 Cheverus Awards at the Cathedral of the Holy Cross. We’ll hear from many of those who’ve received an award this year. But first, Cardinal Seán’s homily for the ceremony. Scot welcomes John Dimasi from St. Theresa’s in Billerica and his pastor Fr. Shawn Allen. He asked Fr. Shawn what makes John such a wonderful parishioner. Fr. Shawn said he’s been in the parish only about a year, but he sees all that John does so quietly in the parish, serving at daily Masses and funerals and singing in the choir. Scot asked John how long he’s been a parishioner at St. Theresa’s. John said since 1961. Fr. Shawn said it’s the year he was born. Scot asked John about his volunteering. He said it started with his wife. He taught CCD for 18 years after the nun in charge of the program had said she had 2,200 children and needed 300 teachers. John felt his wife jab him in the side and told him he could do that. He taught eighth grade for 18 years. They agreed it’s the toughest year to teach. John said he moved to the parish all those years ago because he fell in love with St. Theresa’s. He moved from Arlington to Billerica after attending Mass there for a month first. Fr. Shawn said the women’s club in the parish contracted a bus and they had 30 people who came to celebrate with John. He said it’s a tribute to John to have so many people come at what was the last moment and to fill a bus to be there with him. John said he can’t fully believe it because he works so quietly. So many people make him feel so honored. Now joining Scot is John Dwyer from Holy Family Parish in Duxbury and a member of the Catholic Appeal lay leadership team. He asked John about his role in helping supply some guidance for the Catholic Appeal team. He’d been helping with the appeal in his own parish when the pastor asked him if he’d assist on the archdiocesan level. So he attended regular meetings at the Pastoral Center to provide some of his experience in business. He’d previously assisted in the Diocese of Hartford, where he’d previously lived for thirty years. Scot noted how Catholic business leaders can help the development office make the Catholic Appeal materials better for donors and parishioners. Scot said being someone who asks other to give to the Church financially is one of the more difficult tasks. John said if we don’t support the Church, then we won’t have a Church. If the people don’t support their parishes today, then they won’t have a parish. John said he was taken aback to be selected for this honor. It’s convinced him to try harder to be worthy of the award. 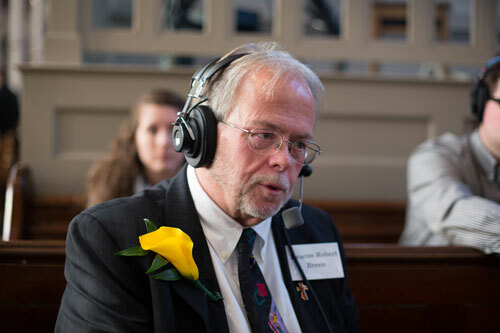 The next guest is Deacon Bob Breen of St. Francis of Medford and master of ceremonies for Bishop Emilio Allue when he does confirmations across the archdiocese. Deacon Bob has been ordained about 4-1/2 years now. He said he was initially at St. Joseph in Medford for a year. He’s a native of Medford. Bob said as Bishop Allue was getting closer to retirement, he had asked for someone to assist him. Bob said that while Bishop Allue is a native Spanish speaker, most of his confirmations are in English. Scot said going around the archdiocese for confirmations shows him the potential in the young people there. Bob said he loves to see all the different parishes and the different ways they approach the sacrament of confirmation. It’s also great to see so much activity within the archdiocese and he recognizes many of the faces at rthe Cheverus Awards from his confirmations. Deacon Bob said being a deacon in the archdiocese is wonderful because it’s not just the ability to help out with faith formation, but also to be available to assist the archbishop in other ways he may need assistance. 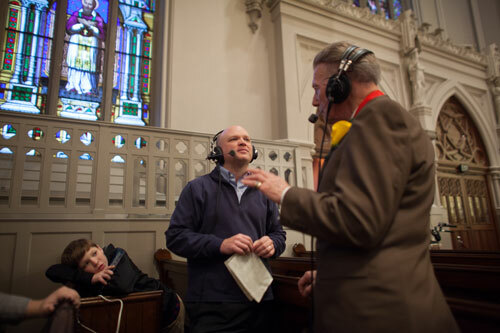 Scot asked how Bob heard the call to the diaconate. Bob said he and his wife were first approached about the idea about 22 years ago and they didn’t think it made sense for them at the time. About 15 years later, they were approached again and he figured those who were asking him knew something he didn’t know. It turned out to be a great experience for him and his family. Bob said receiving the award today gives him mixed feelings. At his ordination, he didn’t do that so he could get a medal, although the medal is cool. It’s a recognition that so many people are doing so many different things in the archdiocese. It gives people visibility into the different ways to fulfill our baptismal call to live the Gospel. 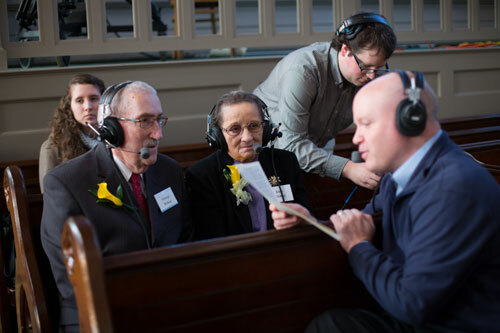 Joining Scot is a couple receiving the award jointly, George and Joan Bishop from St. Ann in Somerville. Scot asked George if it’s Joan’s work that they’re getting the Cheverus Award this year. George agreed. Joan said she volunteered at St. Ann’s for about 45 years. George said way back in 1972 he was asked to get involved in the finances of St. Polycarp parish in Somerville. He was chairman of the finance committee from 1972 to 1995. St. Polycarp has transitioned into St. Ann’s since then. Scot said it can be difficult to make such a transition. George said it was difficult because their hearts with St. Polycarp and didn’t know anyone at St. Ann’s but the priests and people were great and soon they felt at home. It was difficult, but only for a short time. Scot asked Joan she’s worked with over those 45 years. She thought maybe 20 to 25. He asked her what she thought when she found out she would receive an award this year. George said you don’t think of it in terms of being rewarded. You do it because it needs to be done. He happened to be Director of Accounting at Harvard University and this was his expertise and there was a need so he filled it. They discussed the differences between the balance sheets of a parish versus Harvard. Scot said being chair of finance council is a tremendous help to pastors. Most pastors don’t have a background in finances. George said each pastor was very appreciative and grateful. Scot asked Joan her favorite part of her work. She said it was greeting people and helping with St. Vincent de Paul. There are many families who would come to the parish office for help. Scot said in many ways she was the face of the Catholic Church for them. George said they were floored to be notified of the award. Joan couldn’t figure out why they should be rewarded for doing what they ought to do as Christians. Scot asked them how long they were married. George said 56 years, but Joan corrected him to 53. George joked that it feels like 56. Scot asked what it means for them to receive this as a couple. George said he was greatly pleased because Joan is one who works in the background and doesn’t receive the accolades he sometimes receives. Scot now welcomes Patricia Gavin from St. Catherine’s in Norwood. Scot said he’s worked with her sons in the past. She’s worked at St. Catherine’s for 46 years. It’s been a part of their family life ever since they moved into the area. Right now, Patricia is active in St. Vincent de Paul and has become her passion. They serve a number of those in need in Norwood, but she feels she is served as well. She also ministers to those in nursing homes and has been doing it for 20 years in the same nursing home. They do a communion service every Sunday and bring Eucharist to those who can’t attend. She helps run coffee hours on Sundays too and is an extraordinary minister of the Eucharist. Scot noted that her son is a priest in the Society of Jesus. She thanks St. Catherine’s for that and believes his vocation was nurtured in the parish. Her other sons are now also fathers and husbands as well. Scot welcomes Dr. Robert Sperber to the show and congratulated him on his award. Also joining the show is Dr. Mary Grassa O’Neill, superintendent of archdiocesan schools. Scot asked her why Dr. Sperber is a phenomenal recipient of this award. She said he’s an extraordinary volunteer who has given hours and hours in helping with educational leadership and decision-making. He’s a former superintendent of Brookline public schools and a longtime educator. Dr. Sperber said he got involved, after knowing Mary for many years, and he also got involved because he shares deeply the social justice ministry of the Church. He’s long been committed to helping kids who wouldn’t otherwise benefit from a good education. Scot asked Dr. Sperber what Catholics should know about Catholic schools in the archdiocese. Dr. Sperber said that they are safe, that the academic level of performance is higher than that of charter and public schools, and we now have a strategic plan being unveiled to all the schools that give benchmarks to measure progress and make Catholic education in the archdiocese unparalleled throughout the country. Scot asked what being a Cheverus recipient means to him. Dr. Sperber said it means a great deal. Volunteers don’t often get recognized for the work and to be singled out by the cardinal means a great deal to him. He’s very grateful also for the opportunity to working under Mary’s leadership. Scot said the volunteers in our Catholic schools make the difference because there’s so much more to be done than the paid staff can do alone. He asked Mary about all the other volunteers like Dr. Sperber. Mary said all the volunteers deserve God’s blessing and her sincere gratitude. She said Bob provides guidance and mentorship and provides the services of a consultant and is an integral part of their team. Now joining Scot is Lawrence Destefano from St. Patrick Parish in Watertown. Lawrence said his family moved to the parish when he was 11 years old and he’s been there ever since and he’s now 85 years old. He loves St. Patrick’s and loves being Catholic. He said they have three of the most wonderful priests. They are very caring and show they care. Lawrence said the words of his first catechism always stuck with him that God made him and that makes him special. Scot asked Lawrence about how he has helped at the church. He reluctantly told some stories of how he helped. He noted how he had three elderly friends who were sisters who when they died they left more than $100,000 to the parish to install air conditioning in the church. He eventually brought the parish a check for over $500,000. Scot noted that it’s a beautiful church. Lawrence said the priests have made the church even nice since they’ve been there. They brought Lawrence to the Cheverus Awards. Scot asked Lawrence what it was like to hear that he was getting an award. He said he couldn’t figure out what he had done to deserve it. Lawrence noted he was also very friendly with CatholicTV, which is right next door to the parish and then said he will be at St. Patrick’s until they carry him out the door after his funeral one day. 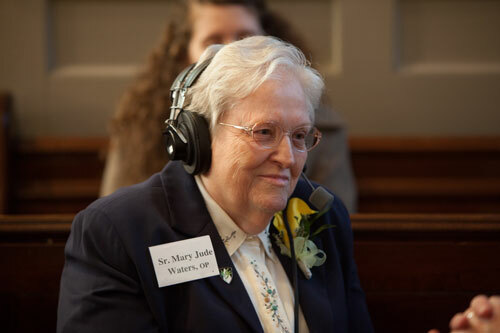 Our next guest is Sr. Mary Jude Waters, OP. Scot said he’s known her through email as she’s been serving at Blessed John XXIII Seminary helping the rectors. Sr. Mary said he’s been there for eight years. She’s the administrative assistant for Fr. William Palardy, the rector. Before that she’s had a number of ministries in the archdiocese. Her first was teaching at North Cambridge Catholic High School. From there she went into the Catholic schools office and worked there for close to 20 years. She taught math and science and she favored math, maybe because it was easiest to teach. Scot asked her what led her to the Dominicans. Sr. Mary said she is from Kentucky and she joined the Dominican Sisters of St. Catherine and their motherhouse was just a few miles down the road and had been a student at the academy and college. Scot asked her about the most lifegiving and fulfilling parts of religious life. She said the congregation she joined was a teaching ministry and she knew that’s what she would be doing. She enjoyed working with the young people. Also the prayer life of the order appealed to her and she found it fulfilling. Now she’s at Blessed John XXIII, which is a national seminary for delayed vocations to the priesthood. She feels like she fits in with the older men who are there. They come in with life experience and work experience and they are to be commended at beginning this whole new ministry at this time in their life. They discussed the challenge presented to the men in going to seminary at this stage of their lives. Scot said many of the people in the Pastoral Center remember Sr. Mary Jude and said that it was fitting she should receive this award. 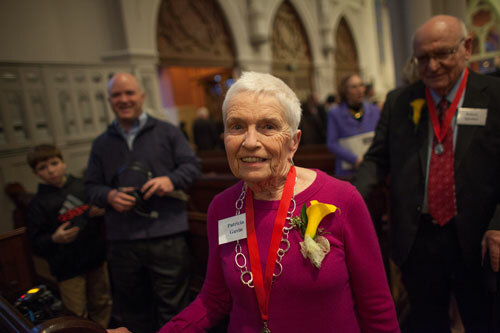 Sr. Mary said this is a privilege as well as an honor for herself and her congregation. She receives it in the name of a lot of different religious in this area.